This year, the NCAA Tournament has nearly been all chalk. If you picked all the favorites when filling out a bracket this year, you’re probably doing pretty well. Unbelievably, all 1,2, and 3 seeds survived the first weekend of the tournament (no Middle Tennessee, South Carolina, or UMBC this year). In fact, all of Kenpom’s top 14 teams are still alive in this year’s edition of the tournament. The others: #19 LSU and #27 Oregon (the only true “Cinderella” remaining if you can call them one). The best thing about the chalk holding: this weekend’s Sweet 16 and Elite Eight matchups will be exceptional. This visualization, inspired by a work by NBA analyst Kirk Goldsberry, depicts the Kenpom adjusted offensive and defensive ratings for each Madness team still standing. 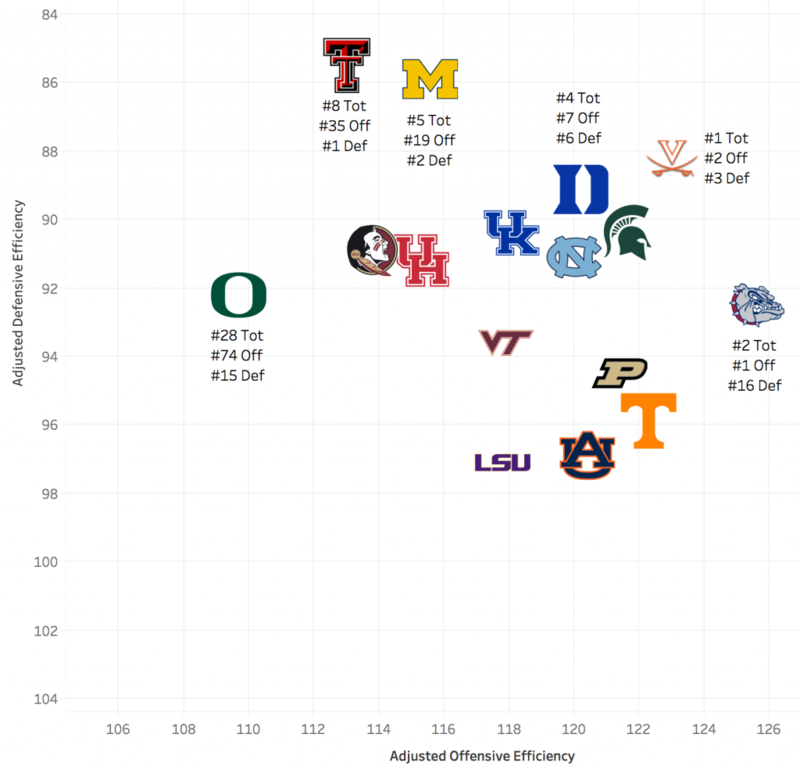 After looking at this graph, it is clear to see that the West region is stacked with top offensive and defensive teams, containing the number 1 offense (Gonzaga) and the number 1 defense (Texas Tech). Expect the Sweet 16 matchup between the Red Raiders and the Michigan Wolverines to be a dogfight, as the top 2 defenses in the country go head to head. The winner of that battle will likely face the number 1 offense in the Zags (pending a possible FSU upset), which if Texas Tech wins will feature the nation’s best offense against the best defense. Count me in for that one. Over at Louisville in the South region, we have the biggest mismatch of the Sweet 16, #1 Virginia vs. #12 Oregon. The highest rated Kenpom team will take on the worst rated team remaining, with Pomeroy giving an 82% chance that UVA advances. But can the Ducks pull off what would be the last chance for Cinderella this year? Oregon is rated 72nd on offense and 15th on defense. Loyola Chicago finished 63rd on offense and 17th defensively and made a historic run to the Final Four. Can the Ducks channel the magic of Sister Jean just one year later? Looking at the graph, we can cluster the remaining teams into three tiers, on our knowledge that teams to the northeast of the chart are better than teams to the southwest. I expect a Tier 1 team to cut down the nets in Minneapolis, but in true March fashion, you never know. Purdue, Auburn, and Oregon are particularly playing stellar basketball right now, but you know those top teams who have worked hard all year round to secure a top seed will not go away easily. One thing’s for sure, it’s gonna be a heck of a weekend for college basketball. ← Wofford: An Underdog Story?